Finishing your deck is not always required but depending on climate and species you may need to coat it with a protective finish. To achieve the desired look and reduce maintenance, finishing your deck material should be done correctly. Pre-Staining is a service that Sound Cedar supplies to help reduce the labor costs of a project, decrease project build time and ensure a professional finish on all sides prior to installation. You choose the stain and the color, we take care of the rest including transportation to/from the professional pre-staining facility. In some cases, decks are built and then a protective coat of stain is applied. This protects the wood from a multitude of things, including UV rays that turn the beautiful color gray. Some stains and protectants also include mold and mildew protection in the form of a fungicide. It is important to choose the correct stain for your project. Choosing a cheap or incorrect stain for the material will result in "chips" flaking up similar to paint chips. You may also end up with a slippery surface from some products that claim to form a sealing layer. Look for a stain that penetrates the wood surface, not one that creates a barrier that can be cracked. 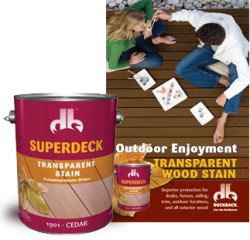 We recommend Superdeck brand Transparent Stains for finishing your deck. It can be applied before construction through our pre-staining service, or you can apply it through the methods in the table below. Brushing Brushing is the preferred method of application. Brushing works well on all surfaces and provides smooth and even coverage. Natural bristle brushes are recommended, although poly or pad applicators can be used. Rolling Roller applicators work well on rough sawn surfaces. Use a short to medium nap roller. Spraying Garden sprayers are a quick and efficient means of application. Back brush after spraying to eliminate pools and puddles. Airless sprayers are the preferred method for large jobs. Use the lowest setting and a large orifice tip to obtain a reasonable spray pattern and to avoid a fine mist. Back brush after spraying to eliminate pools and puddles. This Ultra Premium Red Label Penofin wood sain was created to meet the demand for an exterior wood finish that outperforms all other transparent wood stains. The highly-penetrating Brazilian Rosewood Oil base, from sustainably harvested seeds, protects and nourishes wood fibers far deeper than any other stain. With the added mildew protection the "dark menace" will not attack wood so easily, and helps preserve that freshly-milled look. 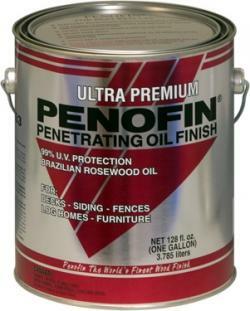 Penofin Ultra Premium Red Label wood stain is perfect where rain, wind, snow, or high elevations are encountered. The formula in Ultra Premium Red Label wood stain is the result of extensive testing, and the use of the highest quality ingredients. Penofin wins the "Battle Of The Stains" penetration tests over all competitors, and gives longer life to wood of any species. Easy to apply and simple to maintain.